Edraw Flowchart ActiveX control is a powerful flowchart and workflow component with source code. It can be easily integrated into applications such as Visual C++, Visual Basic, Delphi, C++ Builder and .Net languages. that lets you quickly build flowcharts, organizational charts, business charts, hr diagram, workflow, programming flowchart and network diagrams. It is a MFC based ActiveX control, compiled with Microsoft VC++ 6.0! Do you want to learn how to draw? Now you can learn it online! 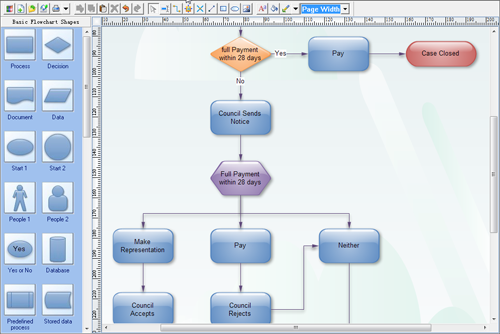 Learn how to draw like a local application with Edraw Flowchart ActiveX Control that lets you quickly build basic flowcharts, organizational charts, business charts, hr diagram, work flow, programming flowchart and network diagrams. Edraw Diagram Component is a drawing board that can be used by developers to create a wide range of diagrams using templates, shapes, and drawing tools while working in an intuitive and familiar Office-style environment. The component is lightweight and flexible, and gives developers new possibilities of drawing flowcharts, organizational charts, workflow, network diagrams and other business charts in a form or web page. You can customize the toolbars and template library according to your requirement. It is an ActiveX control encapsulating a powerful 2D graphic editor and can be easily integrated to the modern integrated development environments like Visual C++, Visual Basic, C# or VB.NET, Access, ASP.NET, Visual FoxPro, Delphi, PowerBuilder, and more. A professional flowchart ActiveX Control to build flowchart and work flow applications with minimum time loss. Drawing online, Easily create online drawing board with drawing control. Support basic flowcharts, organizational charts, business charts, hr diagram, workflow, programming flowchart and network design diagrams. Zooming, scrolling, multi selection and multi-level undo/redo supported. Powerful and easy-to-use drawing tools and many pre-drawn library objects, which means drawing does not need to start anew. A preferential price for a promotional license period. User data association, navigation in the graph. It can be easily integrated into applications written in languages that support ActiveX control such as Visual C++, Visual Basic, Delphi, C++ Builder and .Net languages.